Rice bran oil deodorization process: factors affecting the deodorizer what? 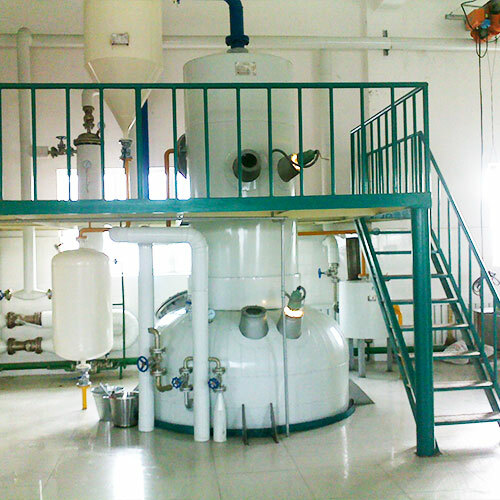 Oil deodorization is the use of the volatile flavor substances and the inner oil triglycerides are very different, by means of steam distillation process to remove off-flavor substances in the process of high temperature and high vacuum conditions. (1) Temperature: increasing the temperature causes a rapid increase in the vapor pressure of the odor substances can reduce the amount of direct steam, the peroxide is also beneficial in vacuo and removal of the decomposition of carotenoid. â‘¢ will produce thermal polymerization, reducing the nutritional value of oil, some of which had some toxicity. At present, most domestic uses intermittent deodorization, deodorization temperature used for 160 ~ 180 â„ƒ. When continuous deodorization, the deodorization temperature is used 230 ~ 2? 50 â„ƒ. United States, Japan and other countries, depending on the circumstances the use of deodorization temperature of 210 ~ 270 â„ƒ. (2) Vacuum: Vacuum high, you can reduce the amount of direct steam to reduce deodorization time, reduce the loss of fat hydrolysis can be obtained free fatty acids containing low-refined oil. There is also help prevent high temperature oxidation grease. Generally use three steam jet pump, if necessary, available four steam jet pumps. (3) through the steam rate: the rate is high, can shorten the deodorizing time, according to the two-film theory, the rate is high, deodorization in favor of mass transfer. Empirically derived optimal conditions deodorized oil by the amount of steam was 125 kg / hr. (4) deodorization time: shorter is better, but also need to remain for some time in the deodorization temperature (called dwell time) in order to improve the stability of oils and fats. Usually intermittent deodorization need 3-8 hours of continuous deodorization 15 to 20 minutes. â‘ with steam. Intermittent dosage of 5% to 15% oil, the continuous and semi-continuous amount of 1% to 5% oil, and this request design inlet pipe diameter. â‘¡ continuous deodorization, the reservoir should be 200 to 250 mm depth at the start of stripping. Intermittent use of large-caliber depth in the reservoir at the start of 1000 to 1400 mm stripping, but also add a loop device, so shallow oil reduces deodorizing time, reducing the hydrolysis of fats. â‘¢ above the reservoir level to ensure adequate space and equipment baffle baffle to prevent splashes. (6) different quality to be deodorized oil and oil products, there is a corresponding impact on the deodorization. (7) direct steam quality is directly related to the oil deodorized to prevent the boiler water into steam to oil. Equipment (8) deodorization system, piping, valves, pumps, etc. should be tightly closed, do not leak, so the degree of vacuum loss and fat oxidation.